Monday 18 March: Scottish Carbon Capture and Storage (SCCS) has signed a strategic agreement with South Korea's leading research institute that will see scientists from both countries work together to develop cutting-edge technologies for reducing carbon dioxide emissions from power generation and industry. 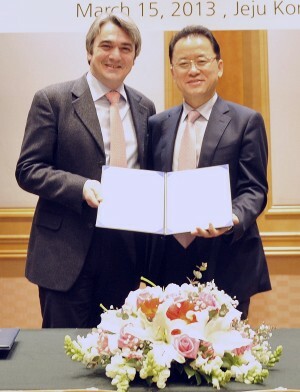 The Memorandum of Understanding (MoU) between SCCS and Korea Carbon Capture and Sequestration R&D Center (KCRC) is the first such agreement to be signed between UK and South Korean CCS researchers. As well as creating a framework for a joint programme of research, it will also enable the flow of knowledge between the two institutes and provide training opportunities for researchers in both the UK and South Korea. CCS technology, which has the potential to capture large volumes of CO2 from facilities fed by fossil fuels and store it permanently underground, has a vital role to play in global efforts to limit global warming. However, a significant amount of research and development is needed to test the technology, as well as reduce costs and improve efficiency. "It is a pleasure to have the opportunity to build on our links with South Korea and establish a formal MoU with KCRC. International cooperation is an essential aspect for the successful deployment of CCS worldwide, and there are clear opportunities for fruitful joint research between KCRC and SCCS." You can read the full article on the SCCS website.